In the past three days I have lost probably two-thirds my hearing thanks to cranking my speakers past what would qualify as "responsible listening levels," especially in an apartment building. I have half-broken my "R" key from mashing the reset button every time I've died. I have screamed untold numbers of expletives at my screen. I slammed my fist into my desk at least four times. I contemplated punching my monitor once. I rage-quit six times. Those are my Hotline Miami 2 stats. The ones that matter, anyway. 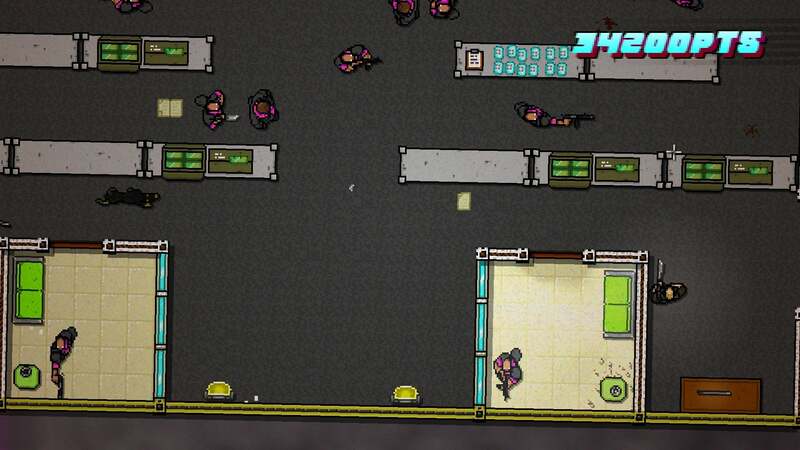 When I first took a look at Hotline Miami 2, I thought "Well this is just more Hotline Miami." Oh how I wish that were the case. Hotline Miami is still one of the best arcade-style experiences I've ever had. It was basically a tight, well-crafted version of Hitman on cocaine—blasting music, brutal murders, and adrenaline. As you played, you'd feel yourself gradually lose yourself in the experience. You'd allow yourself to slip into "the flow," a sort of Zen state of unfeeling efficiency where your murders became almost reflexive. It was crazy. It was disturbing. It was addictive as hell. 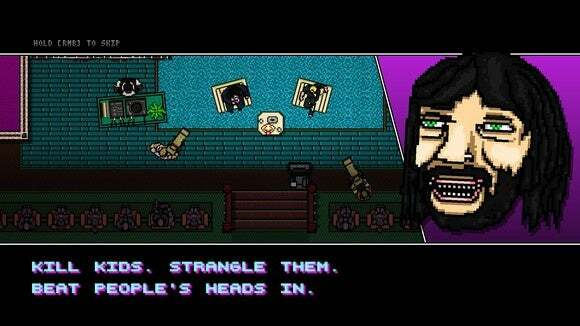 Which is why it's surprising Hotline Miami 2 dispenses with that concept almost entirely. On purpose? I don't know. But regardless, "the flow" is almost entirely missing from this sequel, replaced instead with a slower, more deliberate game that...well, honestly made me want to go back and play the original again instead. The main culprit is a new focus on guns that was entirely absent from the original game. In the original Hotline Miami, guns were (relatively) rare. Your main tools were fists, knives, pipes—basically anything that would make a good thwack noise when swung against a skull. But there's a level in the original Hotline Miami called "Hot & Heavy" that could basically act as a demo for Hotline Miami 2 if you want to know what it's like. "Hot and Heavy" was gun-happy, with tons of glass window panes for enemies to shoot you through if you weren't careful. It was a frustrating mess of a level not only because it led to plenty of unfair deaths but because it restricted the way you played—when guns enter the mix, you either pick up your own gun or (in most cases) you die. But in Hotline Miami, "Hot and Heavy" was just a single misstep in a fantastic game. 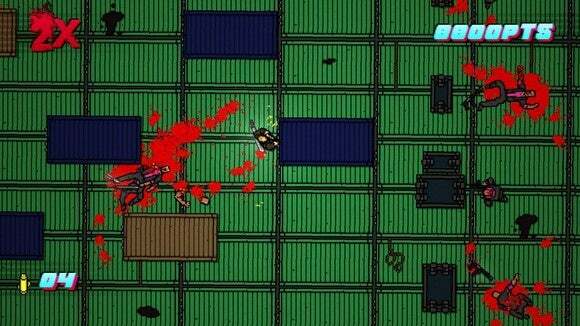 Hotline Miami 2 is an entire game built around guns. Especially in later levels, I'd estimate probably seventy percent of enemies are packing some sort of firepower, be it a lowly pistol or an assault rifle or the way-too-powerful shotgun. 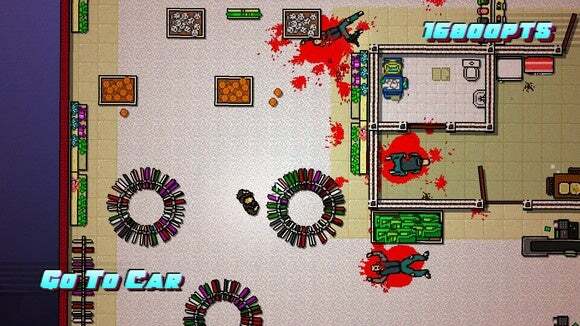 You'll also encounter the Thug enemies from the original Hotline Miami in much greater numbers, and on basically every level—enemies that can't be injured by melee, but only by guns. Reinforcing this focus on guns is the fact that levels are far more open than in the original. After all, guns aren't super useful in a broom closet. Many of Hotline Miami 2's most obnoxious levels are massive, sprawling open areas with tons of gun-toting enemies and no good places to hide. It's in these moments you realize how poor Hotline Miami's controls are when you actually need any semblance of accuracy. Adding insult to bloody, dismembered injury is the enemy AI, which is woefully unpredictable. Sometimes you fire a gun and the guard standing two feet away doesn't notice. Sometimes you fire a gun and enemies from half the map swarm on your position. Sometimes you get sniped by an enemy before he's even on-screen, because that's fun. Seriously. Look how many guns. 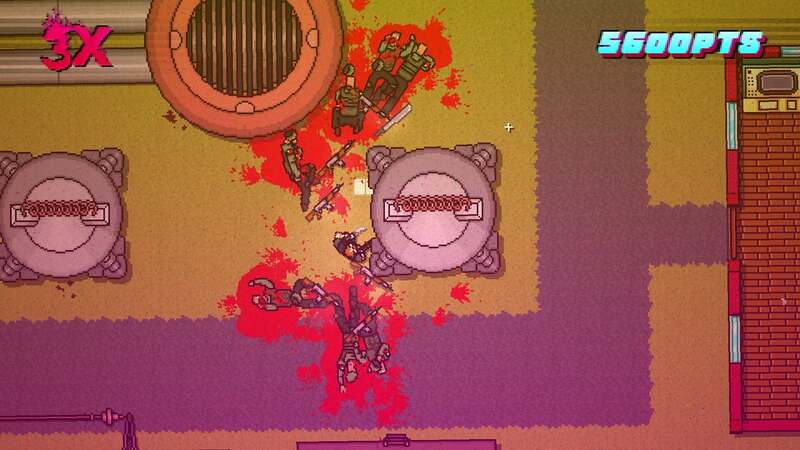 What you end up doing is playing Hotline Miami 2 as a top-down cover-based shooter with exceptionally poor AI. You pop out, let one or two enemies see you, then jump back into cover because they sprint right at you. Then you hit them in the damn face and repeat until all enemies are dead. It's a lengthy game of peek-a-boo where if you peek too long someone shoots you in the face and you start all over. There's none of the improvisational murder of the first game—just long, tedious slug-fests where every "Level Cleared" declaration is a relief. Of course, not every level plays out this way. One character in particular, The Writer, doesn't kill and thus is unable to use guns. In fact, if he does pick up a gun he wastes precious seconds dismantling it—a great twist. The Writer's levels are great because they're the most like the original Hotline Miami. Since Dennaton knows you can't use guns, these levels put less of an emphasis on them. But for the most part Hotline Miami 2 feels like 6-10 hours of "Hot and Heavy." Lots of open areas or at least lots of glass, unpredictable sightlines, lots of guns, lots of hiding. It doesn't feel like Hotline Miami at all. Or at least not Hotline Miami at its best. That's not to say it's never fun or addictive. When all of the elements come together—the incredible music, the eye-searing neon visuals, a few corridors where you get to experience "the flow" again temporarily—Hotline Miami 2 still recaptures some of the magic. It's rare, though. I've left story for last because, well, I didn't really play Hotline Miami for the story. Still, there was an appeal to the original's weird, drug-drenched look at Miami mob life. Did it make a ton of sense? No. Was it at times heavy-handed in its message? Absolutely. But at least it was memorable, and had some semblance of coherence. 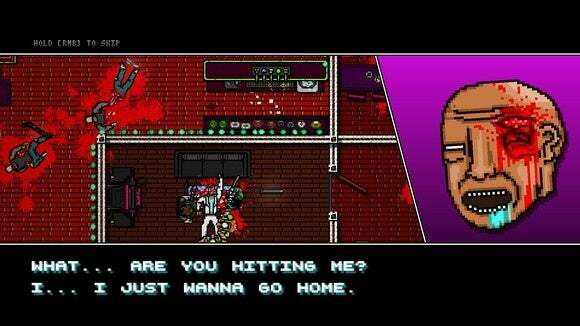 Hotline Miami 2 is a slapdash mess of plot, plot twists, plot "twists," hallucinations, and god knows what else. There are five or six different plot threads in Hotline Miami 2. Only three of those plot threads get anything I'd even come close to deeming a "resolution" while the rest are forgotten. And it's all so deliberately weird that it comes off as trying too hard. The best analogy I can make is watching the sequel to a cult-classic movie—one of those so-bad-it's-good affairs. Almost without fail you realize the first film was good because nobody realized it was bad. When the sequel aims to be so-bad-it's-good, it inevitably falls flat. Hotline Miami was obtuse and weird. Hotline Miami 2 is nonsense. It doesn't help that you're constantly losing the plot's throughline. The game spans three different time periods (1985, 1989, and 1991) and a half dozen groups of characters, and it changes between them practically every level. Good luck following what any of it means when you only get two or three levels per character and those levels are separated by a half dozen others. Oh, plus half the story beats boil down to "It was all a dream! ...Or was it?" and the ending comes out of nowhere. Seriously, even if you somehow disagree with everything else in this review I'm sure we can agree the ending is garbage. Hotline Miami 2 flirts with greatness so many times. There were a few times I found myself slipping into the familiar pipe-to-the-face-now-throw-it-at-this-other-guy-smash-his-head-grab-his-gun-shoot-the-two-running-through-the-door-steal-knife-stab-third-guy flow from the original game. But those moments were rare. 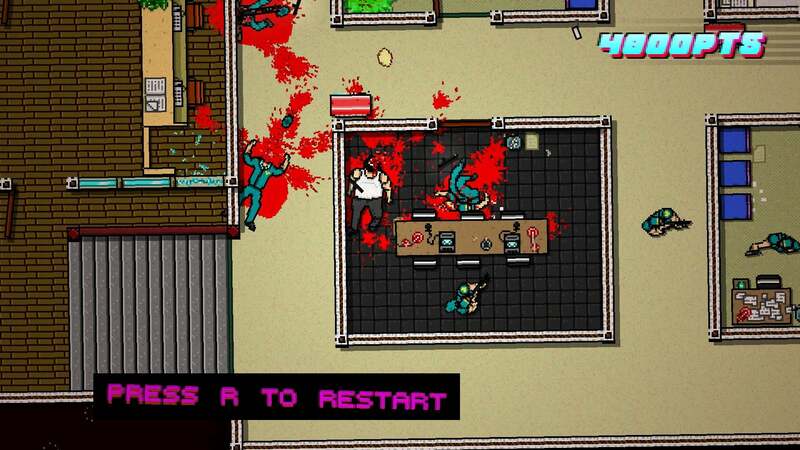 Most of my time with Hotline Miami 2 was marked by frustration—with the shoddy controls, with the enemies who would magically snipe me from across the map, with the stilted peek-a-boo tactics I was forced to adopt to draw enemies out, with the shoddy story. Hotline Miami 2 isn't "just more Hotline Miami." If it was, I guarantee I'd enjoy it more. To its credit, Hotline Miami 2 isn't just "more of the same." But that's also its biggest problem. Too many wide open spaces. Too many guns. Too restrictive.